When associated with myself, the topic of thinning usually refers to the sparse amount of hair that resides (or used to) atop my head. 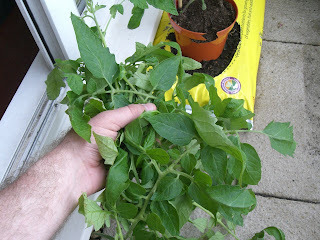 Whilst this has led friends and colleagues to label me the 'Bald Gardener' after Jamie Oliver's iconic 'naked chef' moniker, the thinning I'm referring to in this blog post refers strictly to what's growing on my vegetable balcony. My tomato plants have been growing abundantly due to this spell of very hot weather we're having here in London and on the London Vegetable Garden balcony. 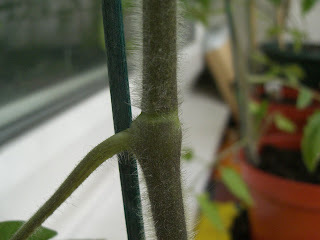 However, many stalks at the base of the tomato plant are purely adorned by leaves, with no trusses or flowers on them. 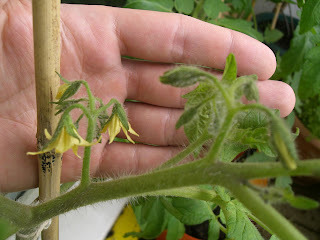 As I stated in my video blog post on thinning tomato plants and removing the suckers, this plant is a very thirsty, demanding plant to grow – any reduction in unnecessary stalks will ensure that water and liquid feed goes straight to the stems that need it the most – the stalks with flowers and tomatoes growing on them. Thinning is a useful way to ensure that the maximum water and plant food is absorbed by the tomato plant – especially when you have three hungry plants competing in the same shallow grow bag! Good luck with thinning your plants and be sure to leave a comment on the London Vegetable Garden letting us all know how you're getting on with your tomatoes. Perusing the morning's newspaper on my daily commute is usually an automated exercise that makes the train journey from Hackney to Richmond less laborious. However, this week I was struck by a news piece that was so relevant to the London Vegetable Garden that I jumped up in surprise, much to the shock of the dozing commuter opposite me! As you all know, one of the main things I've been campaigning for as part of the London Vegetable Garden project, is the opening up of disused spaces for allotment and gardening purposes. With London allotment lists currently more oversubscribed than the Susan Boyle fan club, being a keen gardener within the confines of the M25 can be a 'fruitless' occupation – yet this is simply not fair. So as you can imagine, it was with real relish that I read of the City of London's plans to open up some of the many vacant building sites that have sprung up around the city in recent months. The recession we're currently wading through has put a stop to much building work, leaving large open spaces that are currently unoccupied and unused. Sue Ireland, head of Open Spaces in the City states that: “There are plenty of temporary sites awaiting development and there is no reason why, if carefully done, they could not be turned to other uses. We are trying to identify a site on the edge of the Square Mile that would be vacant for between 18 months and two years. Grow bags are one possibility. They could be butted up together and moved as and when the developers need to start work." This may seem like another social gardening story that will pique press attention for a couple of weeks, but I honestly believe this is the start of a much larger movement. Since the very beginning of the London Vegetable Garden project, I've been adamant that if enough of us get behind a movement, we can bring about change in London's councils and reclaim disused public space for new allotments and gardening purposes. This current news story represents a dynamic shift in local government thinking and is a huge victory for all urban gardeners – let's build on this progress and keep pushing for more allotments and open space – the power to do this is in all of our hands. What are your thoughts? Please feel free to leave your opinion in the comments section. It seems hard to believe that the frail little tomato plants I kept inside the balcony windowsill are now the sturdy, thick-stemmed plants that dominate the London Vegetable Garden's tiny landscape, but after all, mighty oaks grow from the tiniest acorns. Whilst I'm not expecting a crop of acorns (that really would be worthy of an investigation from Titchmarsh et al), I really do hope that my hard work will be rewarded with a few edible tomatoes at the very least! It's now been two and a half months since I planted the tomato seeds and I've included the latest pictures with this update. As you can see, the plants have started growing defined trusses, a few of which have started flowering this week. 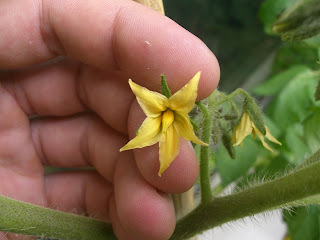 In the picture below, you can see inside one of these flowers – I'm hoping that the tiny sliver of yellow we can all see will start growing into a juicy tomato, but this is the first time I've ever attempted to grow tomatoes, so I'm planning on being patient and seeing what transpires over the coming weeks! I've taken the last picture to show you how tall the plants are getting – they really seem to get thicker and sturdier by the day, which I'm hoping indicates a promising yield. 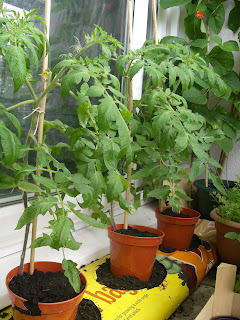 Watch this space for more tomato plant news as it happens! Those of you that have been following my earthy exploits since the very beginning will remember my fears that the tomato plants would be the hardest things to grow. Fast-forward three months and the tomato plants are ironically the strongest looking plants on the London Vegetable Garden balcony, although no fruits have been harvested – as yet! Never one to shy away from a challenge (the London Vegetable Garden is one big – or should that be small – project after all), I'm now attempting a vegetable that requires a significant amount of space – a Butternut Squash. It was the chef, food writer and allotment blogger extraordinaire, Celia Brooks-Brown who convinced me to attempt a squash, so now that I have a free pot once again after this week's radish harvest, I've turned my gardening attentions to this ambitious vegetable! 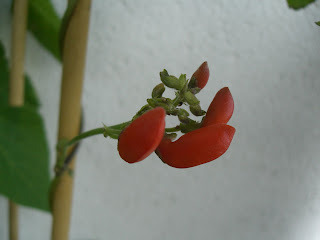 Due to obvious space constraints on a London balcony, I can only attempt one plant – so I'll have to make it count! I planted a seed in a small flowerpot two weeks ago and over the last few days the plants shot up remarkably quickly – yesterday especially, it changed noticeably in size over the course of a few hours. It's interesting to note how sturdier the stem looks than other vegetables, indicating that this really is a hardy vegetable indeed. Whether it'll have enough room to grow in the large pot I have waiting for it remains to be seen, but stay tuned to the London Vegetable Garden to monitor its progress over the coming weeks. Morning all – just a very quick blog post this morning to kick the weekend off and proffer some green-fingered London vegetable gardening advice. When planting out tomato plants (or any other vegetables / fruits for that matter), many of us tie string or ties around the stem to fix it to a supporting cane. Now, this is all well and good, but one thing to remember is that plants grow thicker, as well as taller! I was replacing my plant supports with bamboo canes the other evening and came across a piece of string on one of the tomato plants. Now, I thought I'd removed all of these bits of string, so was shocked to see one I'd left! 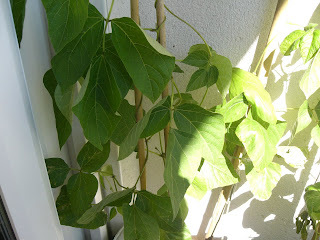 As you can see from the picture below, the string had indeed been cutting into the stem of the plant as it grew. Luckily I caught this in time, and it has since recovered, but strangling your plants with string and ties is a veritable menace that many amateur gardeners overlook. If you've used (or are planning to use) ties or string, always make sure that you leave some room for growth in the loop and check back regularly. I hope that Mr Bob Purnell will excuse me from drawing so heavily on his book title for this blog post, but my excitement this morning can't be contained – the London Vegetable Garden has yielded its first radishes! In hindsight (a wonderful thing, but I'm hoping my mistakes will help you chaps out there), I planted my radish seeds too close together, so many of the plants and leaves have been fighting for a very small space. The resultant crop of radishes has therefore been quite varied, as you can see from the picture below, although amongst those, we do have some decent looking ones! As you can see, although I haven't managed to grow enough radishes to open a stall at a farmer's market (yet), this hopefully illustrates just what can be achieved from the confines of such a small urban vegetable gardening space. 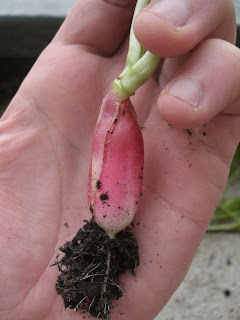 I'm really proud with these big radishes – and the fact that they look so similar to the picture on the packet! 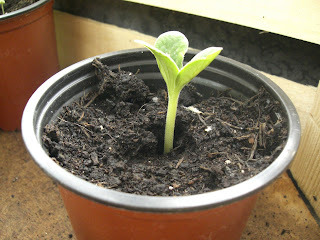 Please take this as motivation – which is what this London vegetable gardening blog is all about. 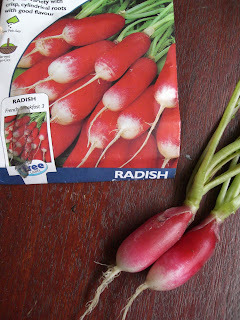 Why not try planting some radishes of your own? Simply use a decent sized pot and remember to SOW THINLY! Good luck – I'd love to see everyone's results. After all, if I can achieve this on a London balcony next to a busy, smoky London railway line, your balcony, windowsill or patio can too! Well, here's another first from the London Vegetable Garden – the first video blog / podcast! As the tomato plants get nearer to their final growth stage, it's important to spend a few minutes looking after them and performing some quick, green-fingered maintenance. Have a look at the one-minute clip below and please feel free to leave some feedback in the comments section. If you like seeing video clips of gardening advice, this could well be a regular feature on the London Vegetable Garden blog. Enjoy! 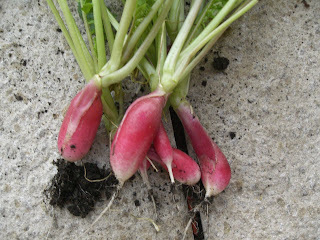 Saturday morning on the London Vegetable Garden has brought about great excitement and it's radish-shaped! That's right, whilst I'll readily admit that I planted my radish seeds too thickly to bear a large crop (the benefits of hindsight...), the radishes that have been growing are now looking ready to be harvested. When growing vegetables, or any plants for that matter, it's always important to regularly check the surface of the soil and clear it of old leaves, dead flower heads etc, as this can decompose and have a detrimental effect upon the health of your vegetables and plants. I'm going to leave them in for another week and then harvest the ones that are poking out of the surface, like these ones. I'm hoping, in addition to fresh radishes in a salad, that the smaller radishes that have struggled will now have some more room to grow – it'll be interesting to see what happens. Ensure you check back regularly to find out what happens when they're pulled out! Avid followers of the London Vegetable Garden could well be forgiven for thinking my agricultural attentions have been too focussed on flora and fauna in recent weeks. Fear not, as vegetables are very much still the focus of the balcony and this blog, but one of the window boxes has looked rather dilapidated in recent weeks and the time has come to re-do it. As you can see, I planted ivy in this window box over a year ago. Whilst their longevity is a testament to the hardy nature of the plant, this one really has become too big for the box it's planted in. You can see from the stem size below just how big the plant has come; whilst it would flourish in a garden, planted in the ground, in this window box it really has reached its limit. It just so happened that when making a (compulsory I might add) visit to Tesco, they had some cheap bedding flowers on offer for £3. I've done well out of supermarkets for cheap gardening paraphernalia recently, including the excellent grow bags I blogged about a few weeks previously. A pleasant weekend afternoon was spent potting this new plants into the window box, although in terms of outside space, it's proving more and more difficult to manoeuvre out on the balcony! I'm hoping that in a few weeks, we'll have a beautiful floral display acting as a colourful centrepiece of the London Vegetable Garden. Watch this space. Most definitely a storm brewing - nature looking menacing, yet hauntingly beautiful at the same time. Just thought I'd add a quick blog entry showing how the petunias are faring - half of the London Vegetable Garden is currently awash with colour thanks to these bedding plants. 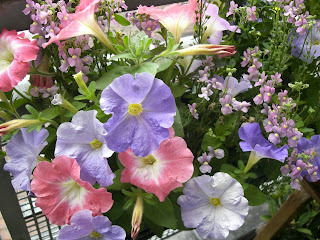 I highly recommend keeping your eyes open in supermarkets or garden centres for some bedding petunias. In the space of a few weeks they've grown spectacularly and make a real impact to any balcony or garden. You could even pot them on a windowsill. It's a well known fact that the banalities of life (such as a job, visiting the doctors, doing the shopping) all detract from valuable gardening time. The aforementioned banalities also consume valuable blogging time, which is why the London Vegetable Garden has been as sparse as my carrot plants in recent weeks - you have my sincere apologies. But moving on, I've managed to weed some time into my diary to get firmly back on track with recording the progress of my organic odyssey. 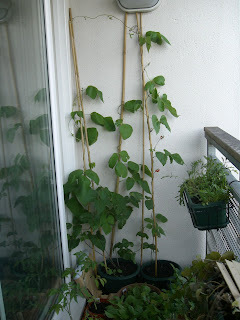 The recent hot weather has been responsible for a huge surge in growth, with vegetable plants taking over much of the London Vegetable Garden balcony. This has harassed the other half immeasurably, as putting out the clothes horse now requires military precision to avoid squashing tomato plants and radish pots. 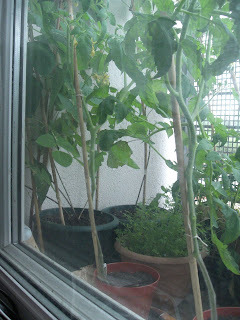 It gives me however, plenty of new fodder for a blog entry and an update on the London Vegetable Garden! 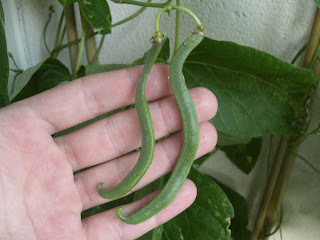 The plants that have fared the best in the current British heat wave are my runner beans. Two plants died recently, which I fear was my own fault when I removed the bottoms from their pots to place over the grow bags. With these weeded out, along with plenty of water and sunshine, their fortunes have reversed and thay now dominate the balcony wall. It may not be a particularly spectacular harvest, but the London Vegetable Garden has enjoyed its first taste of edible, balcony-grown organic produce! Over the past week, the rocket has looked good enough to eat - so we did precisely that! Accompanied by the other half's exquisite lasagne and accompanying many salads, we've enjoyed a surprising amount of rocket from such a small window box. They say that giant oaks grow from tiny acorns and I hope that although this humble rocket is a modest start to my project, it's a prelude to exciting vegetables to come. Simply a few window boxes are more than enough for any amateur London gardener to produce some enjoyable results and I'd imagine it's not too late to enjoy some of your own. 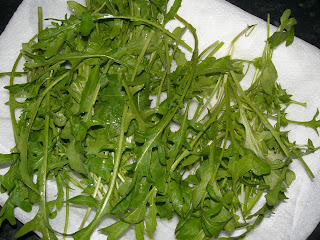 In just under two months, I've planted, grown and harvested plenty of tasty rocket. All I used was grow bag compost, a window box and plenty of water. If you're diligent enough to check your rocket plants each night for watering, this really is the maximum extent of your efforts. The window box on my balcony faced inwards, so whilst gaining a lot of sun, had some partial shade too. Good luck growing your own - if anyone else has had a rocket revolution, please comment and share your findings!